Get the Ladies Together, & Leave Those Guys Behind! A girls trip to the Kiamichi Mountains is long overdue, and you know it! The best part about a girls trip is that you get to take joy in uninterrupted time spent together to grow your female friendships, and much like any relationship, it takes some nurturing. Sorry boys— sometimes we need to surround ourselves with our girls to feel rejuvenated again! Leave the planning to us as we’ve prepared a great list of the places to swing by during your stay at Kiamichi Cabins on your girls trip! You’ll feel like a new woman when walking out of Body Harmony Day Spa after experiencing complete relaxation during your ninety minute Body Harmony Experience. At Body Harmony, you will become the center of attention as they cater to your individual needs. During your massage, your body will melt into a memory foam mattress as the relaxing music vibrates through your entire body from the bed. The experience will include a dead sea mud facial, an African shea butter massage of your chest, neck, hairline, shoulder, face, and scalp, as well as an entire body massage. Your skin will also be exfoliated by a dead sea salt scrub, wrapped in hot steamy towels all while taking in the scent of an essential oil mist. De-stressing on your girls trip is a must so be sure to call ahead to make your reservations! Owned by three best friends, Girls Gone Wine is a perfect stop to make on your girls trip! You’ll have a fabulous time with the girls trying a variety of wines with a complimentary wine tasting. Girls Gone Wine is the ideal place to gather and gossip with girlfriends as well as making some new friends along the way. Each bottle of wine has a unique story and characters drawn by a local female artist on the label, and you’ll definitely leave with a bottle of wine— or five! Gather with your friends on the patio during a hot summer afternoon and be sure to stop in the sassy giftshop on the way out! A girls trip would not be complete without shopping so grab the girls and head to Once Upon A Time. Hunt through the nooks and crannies at this local flea market and discover unique gifts, quirky decor, and genuine antiques. You’ll find an eccentric collection of treasures so be sure take your time browsing through this cute little shop. There are many different items to pick up as each vendor displays their own goods, and new things come in frequently so you may want to stop by a few times during your stay in our Kiamichi Cabins in Oklahoma! The Kiamichi Mountains are a great area to get away with friends to relax and recharge. 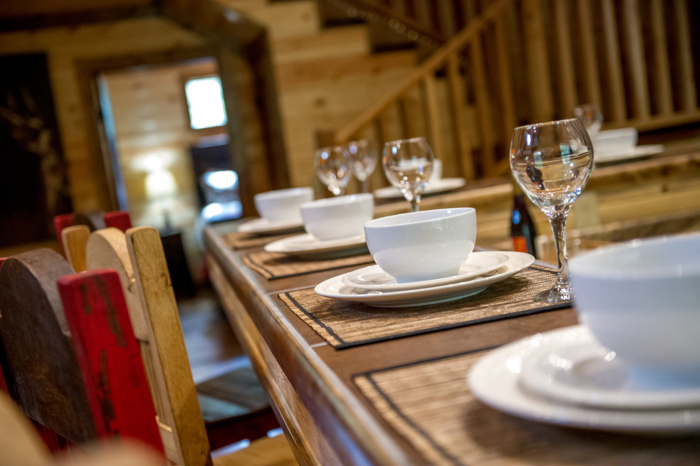 Our quaint Kiamichi Cabins offer a fully equipped kitchen so that you’re able to enjoy a home cooked meal with your friends as you gather around the table and talk about life. After a day out exploring, come back to take a dip in the hot tub, or spend time around the fireplace with a glass of wine. Call our friendly staff to book your girls getaway at 580-584-7311, or visit us online! There’s nothing better than being surrounded by a blanket of greenery in the springtime, and Broken Bow OK is no stranger to beautiful views this time of year. Approximately ten minutes from most of the Kiamichi Cabins, you’ll find pet-friendly Beavers Bend State Park. Wrap yourself in the serene wilderness, listen close to authentic sounds of nature, and keep your eyes peeled for beautiful wildlife. The sound of birds chirping and water splashing brings a feeling of rejuvenation and life. There’s a variety of hiking trails ranging from an easy walk with your kiddos to more challenging hikes for experienced adventurers -and don’t forget to bring your dog along. A favorite park with the locals, Beavers Bend State Park remains peaceful even during the busy season. Enjoy a stroll knowing you’ll be in a clean, well-maintained environment with your loved ones. Beavers Bend State Park is a real gem for all ages. Located just a few miles from most of the Kiamichi Cabins, Hochatown State Park is not just a majestic state park, it’s a photographer’s dream! Deer are everywhere in Broken Bow OK, so tell your kids to keep their eyes peeled while you’re hiking along the creeks. Take your time exploring the nooks and crannies at Hochatown State Park. Snap pictures of the crystal clear rock-bottom waters, and if you’re lucky, you’ll see a bald eagle on the other end of your camera lens! This state park features less clutter of human-made amenities, and with the spring foliage, you will have the opportunity to capture a great landscape or wildlife photograph. Hochatown State Park is a little piece of natural heaven. The hills are alive with the sound of deer in Broken Bow OK! “Pine Ridge Trail” is a great trail for beginners. While other trails cross over various creeks and streams, you'll make your way through the forests and hills within a few miles of Kiamichi Cabins. 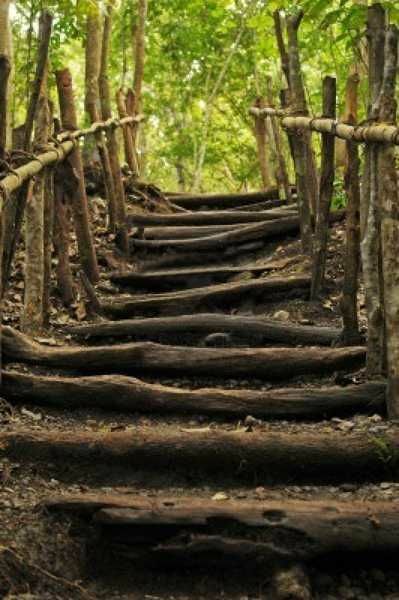 If you are looking for something a little more difficult, try “Deer Crossing Trail” take a moment to notice the smells of springtime while viewing the trees as you rest between some of the many hills during this hike. Deer Crossing is not an expert hike but it's one worth being prepared for! For those of you who are ready for a challeng, “Cedar Bluff Trail” offers steep climbs and creek crossings, but you are rewarded with some of the best views. Wrap up your vacation with a walk for those who want to get their daily recommended 10,000 steps in! A visit to Broken Bow OK should always include a hike or two during your stay. 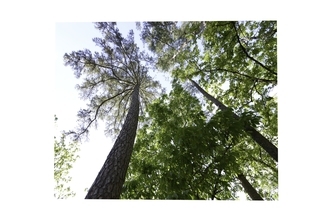 Get the most out of your vacation with a visit to one of these three hiking trails or others offered by Beavers Bend State Park. And remember to book your much-needed getaway to Kiamichi Cabins by dialing 1-580-584-7311.